The Herpes Blood Test looks for the herpes IgG antibodies in the blood. If you have been exposed to the herpes virus then this test will be able to confirm whether or not you have herpes and it will be able to distinguish between Herpes type 1 and Herpes type 2. Please note that this test is not recommended as the primary testing method for the herpes virus and the medical utility of this test is questionable. The test is made available as a “peace of mind” test to rule out the possibility of herpes. The result will be reported as either negative or positive for the two types of herpes individually. The Herpes IgG antibodies normally appear in detectable levels in the blood around 12 – 16 weeks following infection. They can appear sooner in certain people but if you test earlier then you will need to repeat the test at 16 weeks for a definitive answer. We do not recommend the herpes blood test as the primary method of testing for herpes as it is not site-specific. If you have lesions that you are concerned may be herpes then we recommend that you have a Symptomatic Lesion Test. This test will check for both herpes and syphilis. We can also test for herpes from a urine sample and from a PCR swab as an individual test. These tests are only appropriate if you have symptoms, as they will only be able to detect the herpes virus if the virus is present and shedding. These tests are site-specific. The herpes blood test is capable of giving a positive result even if you are not symptomatic. Some websites offer the IgM herpes antibody test - you should avoid this test as it is unreliable and does not convey any meaningful information. The IgM antibody can be produced each time there is a recurrence of symptoms so it does not tell us how recently the patient was infected. Also, the IgM antibody is negative in around 50% of patients who recently acquired the virus and have had this confirmed by other methods. How does the Herpes Blood Test work? We will send you a self-collection kit whereby you take a small sample of blood via a finger prick. The collection kit is specially designed for patients to use at home. You then send the sample back in a reply paid envelope. 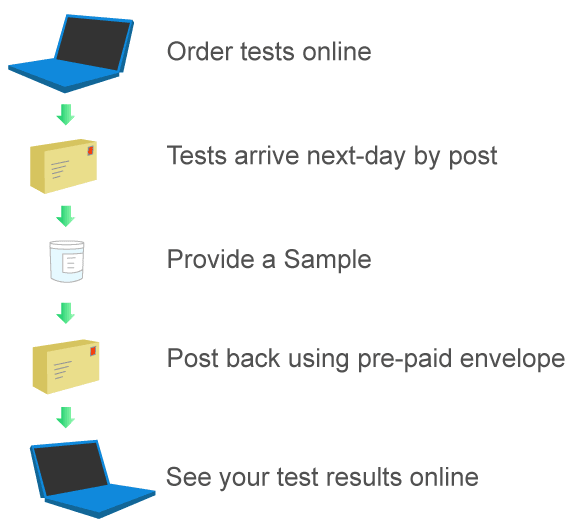 We will let you know your results within 48 hours of the sample arriving at the laboratory. Please note that the biochemistry lab that runs this specific test is not usually open on Saturdays and Sundays so this can affect the turnaround time for samples received over the weekend. Herpes treatment is only required if you have symptoms that have been confirmed to be caused by the herpes virus. The treatment will shorten the duration of the herpes episode and make the symptoms less severe. Treatment does not cure you of the herpes virus and it can recur in the future. There is no point taking the antiviral medication if you have a positive antibody test and you do not have symptoms - it will provide absolutely no therapeutic benefit. If you require any help selecting the right test for you, please call our patient help desk.